Here is an overview of low-VOC and zero-VOC sheathing and subflooring options. Structural plywood (Softwood Plywood - SWPW) can be used for exterior sheathing, roof decking and subfloors. It is made with phenol-formaldehyde glue (PF) in the US and Canada. While 0.1 ppm is high for someone sensitive, the fact that the panels rapidly offgass should make them tolerable for someone with MCS. I would suggest testing plywood that is a few months old. OSB is a mix of MDI glue and PF. MDI offgasses isocyanates. Both Avatech and ZIP systems contain MDI and PF glues. Purebond plywood is not rated structurally or moisture-wise for sheathing, subfloor or decking. I have spoken to the company and they don't recommend it used for this purpose though I do see people building with this product. I don't recommend it. Plyboo is a bamboo-based plywood made from soy glue as well and is also not structural. A non-wood option is Georgia-Pacific DensGlass, which is around 3 times the cost of OSB. It is very low VOC; they are going for GreenGuard certification. It is also a lot more mould resistant than OSB or plywood. Make sure with all materials it fits the codes where you live (in terms of high winds and earthquakes). Make sure it is also compatible with your exterior finish. MgO board is now starting to be used as exterior sheathing. Another zero-VOC option. It is heavy, structural and more expensive than plywood. Rigid foam can also be used as exterior sheathing without any ply or OSB. The rate of XPS offgassing is very low, but it does contain a flame retardant. The other option is Polyiso. The Johns Manville brand is popular. Here is some info on how to brace when using rigid foam as sheathing. This is not structural and should be checked against local codes. Another structural option is Rewall which is made of recycled beverage cartons and cups shredded and compressed. It claims zero-VOCs. It is paper-faced. Consult with your architect or engineer here. It is possible to use structural cementitious sheeting board (MgO) as a zero-VOC option however when I did this in my tiny house I needed additional framing support underneath. It worked out well for me. Here is an example of the support you need underneath. This is probably only suitable in a tiny house. For those who can't tolerate wood, it is possible to pour a concrete upper floor. Purlins or skip sheathing can be used as an alternate form of roofing which eliminates the need for solid sheathing. This will only work with certain roof types (metal vented attic, in some cases cedar). For exterior sheathing, 1-by lumber laid diagonally was used. This is not an airtight option so humidity and energy issues should be considered. Make sure to use housewrap. Consider double sided housewrap tape so that you get more of an air barrier. For subfloors, 1-by subfloor were laid diagonally to the floor joints. 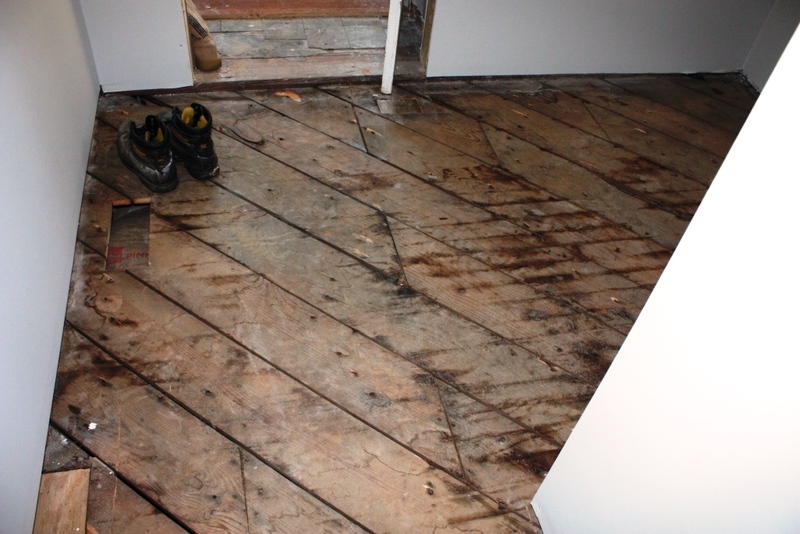 The subfloor could be planks or tongue and groove. Here is a little more info and a pic of planks. This is a zero-VOC option but it will cost you quite a bit more. If you use this method make sure you use a subfloor adhesive otherwise you will have a very creaky floor. Liquid Nails is the lowest VOC option I have seen at less than 20g/l, but I find Almighty Adhesive to be more tolerable. For decking, 1x decking butted up to each other can be used. This is how roofs were built before plywood or OSB. This will allow for many types of roofing types over it. What about MgO Board? George Swanson, builder from Austin, TX, uses MgO for exterior applications as well as interior. I think he also uses it for roof sheathing... Thoughts? We used it as flooring on the 2nd floor of the house we're building. Also going to use as inside walling and outdoor decking with tiles over the top. We used Modakboard MgO board from Australia. Great company! Sent samples wrapped in foil for me and everything.